Recruiters for the Marine Corps typically meet their annual quota, as filling the needs of the USMC is about twice as easy to fill the Army recruit needs. 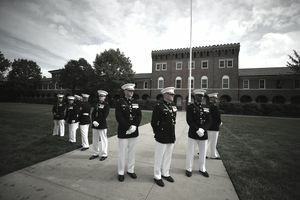 With the exception of the Coast Guard, the Marine Corps is the smallest military service and only needs to enlist about 38,000 new recruits per year, compared with the Army's average 80,000 yearly recruiting goal. You may have an experience with a Marine or any military branch recruiter one year where they are highly proactive and reaching out to you to see if you are interested in military service. During these times, the military is typically in need of bodies to fill the basic training and boot camp training pipelines. However, if the recruiting process is easy and the military is meeting all of their needs, getting into the military may prove to be more of a competitive endeavor. During times of war, the need for greater numbers of recruits can increase significantly. Depending on the economy and political climate of the war, it can be very difficult to meet the required new quotas. During the 1960s-70s, it was very difficult to recruit young men and women to serve in the military with the Vietnam War raging and a political and social climate that did not make it a favorable choice for many Americans. So much so that the draft was required to meet the growing needs of the military numbers. However, if times were similar to after being attacked on December 7, 1941, or September 11, 2001, the need for more recruits will be greater but the enormous response of young men and women seeking to serve will also increase to meet the growing needs of the military. During these phases, the military has a variety of standards to uphold entry-level recruits. These can be waived or altered depending on the national urgency of recruiting needed, so there are times it is easier and harder to join the military. The Marine Corps can be selective with their recruits and require higher physical standards, ASVAB scores, and medical standards when needed. However, during times of need and difficulty of recruiting, signing bonuses can be added as well as new enlistment programs to assist with preferred jobs (MOS) and education and training a newly signed recruit can receive if they qualify. The Marine Corps requires a minimum ASVAB score of 32 to enlist. However, over the past several years, about 70 percent of all new Marine recruits have scored a 50 or above. The Corps recruiting regulation only allows about five percent of their enlistees per year to join without a high school diploma. However, during recent years, 99 percent of new Marine recruits had a high school diploma or at least 15 college credits. To even be considered for a GED enlistment, an applicant must score a minimum of 50 on the on the ASVAB (your chances are much better if you score at least a 90). The Marine Corps is the only service which requires a waiver if you admit to any history of marijuana use. However, if you've used pot less than 10 or so times in your life, it's very likely the waiver will be approved. The Marine Corps generally approves a higher rate of criminal history waivers than the Air Force and Coast Guard, but -- because it is such a "physically intense service," it generally approves fewer medical waivers. However, there are some crimes that will never receive waivers. Moral waivers for felonies are rare, even during times of need, but do occur on a case by case basis. Recently, the Marine Corps announced that it will no longer waive any criminal sexual offense, no matter the circumstances. While the Marines will consider qualified prior service applicants, all non-Marine prior service enlistees must attend the full Marine Corps basic training (the Marines are the only service with this policy).